This is the Torch dilemma. Although I've thrown down some torch controls (which would replace the Milling controls) there are more of them. I because I don't have and use a torch, I don't know which ones are imperative to keep on hand, meaning that they get adjusted daily, and which ones might be moved to the "Tool" menu. Could someone who has a torch give me a hint on which ones you use the most? In the meantime, I want to rework (lower-center) location panel to once-again include coordinate systems. Last edit: 29 May 2018 04:07 by BrendaEM. This is an experiment to include the user coordinate controls. 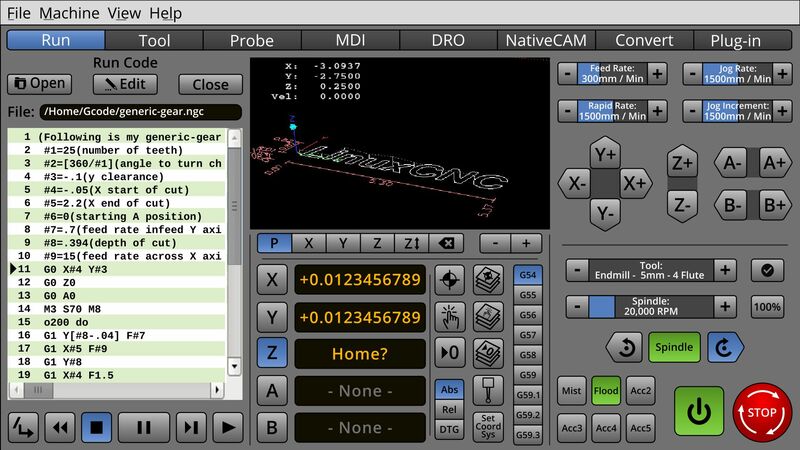 Some people may take issue with this but, I don't like seeing gcode on the user interface, unless they were a macro key for the user. Also, I am not sure that shouldn't be a progressive chooser because it makes the panel look busy. Speaking of busy, there should be a Fullscreen icon. Last edit: 29 May 2018 05:04 by BrendaEM. KCJ, I've seen people use the coords for multiple parts, and different fixturing. What I was thinking is that the lefthand 1/3rd of the screen would be switched for different modes of operation, and then they could go fullscreen from there, if need be, So, the "Run" or "Run Code" is actually showing in the mockup. So, if you want to use the MDI, to type something in, you click on the tab, and the "Code Runner" panel would be replaced with the MDI. This is why I wanted all of other positioning controls on center an right panels. Last edit: 29 May 2018 09:23 by BrendaEM. I did not realize only the left side of the screen was going to change based on the Mode, I like that very much! That means that 'muscle memory' will make it very easy to reach the more safety related controls on the right. * Made still more room for the Mill / Torch / Laser specific controls. * Continued work on DRO. * Cordoned off main power controls. 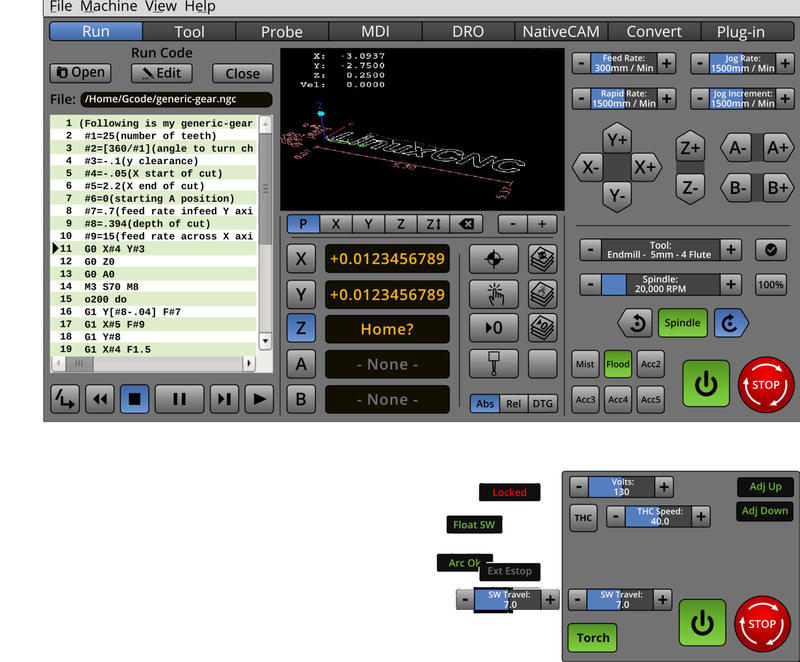 Note: DRO and Run-Code are toggled to display in the left-hand panel. That is looking really, really good! I would defiantly be willing to help implement this screen in any way I can. I am not any good at the graphics/human factors stuff, but I can help code. Kcj, that sounds quite agreeable. I am trying to give this enough thought so it covers most needs. I wish I had my machine done, so I could get some better first-hand knowledge. I want to try to lay rough out the other pages, just enough to make sure I haven't forgotten something on the main interface, which would be the tab-bar that runs across the top, and the center and right panels. 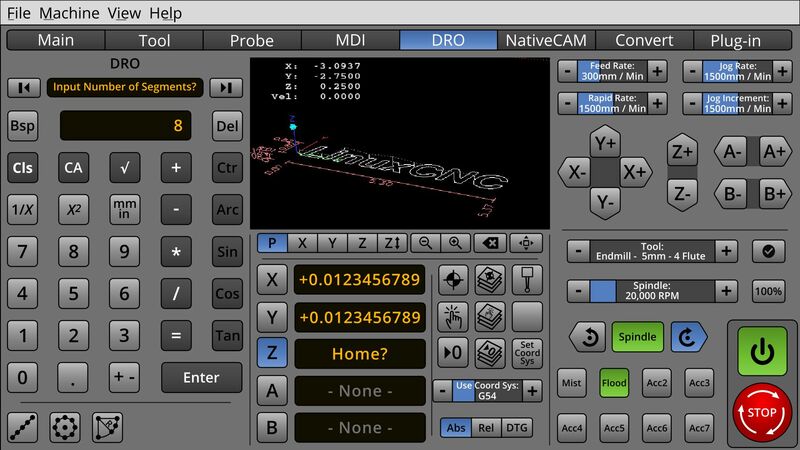 I am doing this in Inkscape, so the graphics can be output for either 1080 (or even 4k,) though I would like to keep a 16x9 aspect ratio, which may upset some people, but I want LinuxCNC to be forward-thinking and forward compatible. Last edit: 31 May 2018 01:48 by BrendaEM. Just out of interest what size, in mm or inch would a "standard" button on the interface be in relation to a particular screen size? Last edit: 31 May 2018 03:19 by AnnoyingMutt. X,Y,Z controls are 10mm square. With the upcoming changes, the Estop is 20mm square + whatever the gutter affords. The power 20mm x 10mm. The Increment adjuster ends are 7.5mm square. The view controls are 10 x 7.5mm. The Jog directional buttons are 10 x 15mm.